The Labor Notes Conferences I attended in the 1980s attracted hundreds of labor activists. Over the years they grew incrementally until the venue was shifted from Detroit to Chicago in 2012. Recent ones have been qualitatively bigger and the April 6-8 gathering this year brought together 2800 working class fighters—including many from outside North America. The monthly Labor Notes publication launched in 1979 was based in Detroit for good reason. It was then the center of a thriving auto industry and union and also the anchor of the Teamsters union. The founders were very active in the New Directions opposition in the UAW led by the remarkable late Jerry Tucker, and Teamsters for a Democratic Union guided by Ken Paff, still present at this year’s conclave. Automation, offshoring, gut-wrenching give-back contracts, and failure to organize Asian and European “transplants,” decimated the Big Three plants where New Directions had some influence. Most of the 1979 ND activists are now retired. TDU was an important ally in Ron Carey’s 1991 defeat of the Old Guard leadership in the first ever membership vote for top officers. The last major national strike victory–at UPS in 1997—was on Carey’s watch and TDU activists played a major role in its success. But another “ally”—Citizen Action—broke some fund-raising rules that allowed the Hoffa wing to eventually nullify Carey’s re-election and expel him from the union. In the last Teamsters election the TDU-backed candidate came within a couple of thousand votes of unseating Hoffa. TDU leaders I have long known in Kansas City and Chicago are optimistic about their chances in the next election—but for now are properly more focused on UPS negotiations. Mergers and independent owner-operators have resulted in many lost union truck driver jobs. To offset some of this damage the Hoffa leadership convinced some craft unions to affiliate to a new Teamsters Rail Division. Many of those attending the pre-conference convention of Railroad Workers United were IBT members. While traditional union jobs were lost in manufacturing and transportation public sector unions grew in size and activism. 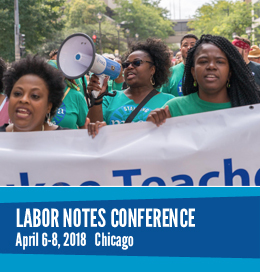 Moving the LN conferences to Chicago was spurred by the militant, democratic American Federation of Teachers Local 1—the Chicago Teachers Union. The CTU not only mobilized their ranks for battle but won strong support in the community. They took on Mayor Rahm Emanuel—who had forced the UAW to eat more concessions during Obama’s bankruptcy take over of General Motors and Chrysler, once remarking “f*** the UAW”–and beat back most of his take-away demands. Their struggle proved to be pivotal in labor conflicts. Different groups of teachers were the main attraction this time. There was a big delegation from West Virginia fresh from an “illegal” strike victory, and some from ongoing battles in Oklahoma, Kentucky, and Arizona. When I tried to attend a workshop led by West Virginia heroes I literally could not get in to the very large room—I think there must have already been a thousand who beat me there. There were also sizable contingents of public sector health care and transit workers represented by AFSCME, NNU, SEIU, ATU, and TWU as well as Federal workers in AFGE and postal worker unions. A hot topic for them was the anticipated Supreme Court ruling on Janus. Janus would prevent public sector unions collecting even “fair share” fees in lieu of dues to finance basic contract negotiation and enforcement. It is calculated to get rid of unions through bankruptcy. But while a serious attack it need not be fatal. So-called “Right-to-Work” laws that prevent private sector union shop agreements haven’t destroyed unions through starvation. Dues check-off didn’t become common in this country until it was granted as one of the government concessions to unions in exchange for a no-strike pledge during World War II. Any union worth its NaCI should be able to convince members their dues are a reasonable price to pay for representation. Because my wife Mary—attending her first LN conference—and I came in on Amtrak we arrived the afternoon before the first session. That gave us a chance to go on a Labor History Bus Tour the next morning. Our Guide from the Illinois Labor History Society did a masterful job in explaining the significance of such sites as the cemetery where many working class martyrs and leaders are buried and the Union Stockyard Gate reminder of when Chicago was “hog-butcher to the world” and its many packinghouse union battles up to the 1960s. Of personal interest to me was a stop at Steelworkers Park—a vast expanse of grass on Lake Michigan that was the site of US Steel South Works. When I briefly worked there in 1964 it employed nearly 20,000 workers operating four open hearths 24/7. There were over 200 workshops and plenary sessions on a very wide range of topics. We could, of course, only attend a few. Mary has a string of initials after her name but mainly earns a living as a self-employed Certified Industrial Hygienist. She was excited to see a workshop scheduled on “Workplace Health and Safety in the Trump Era” with the legendary Jordan Barab as the presenter. I tagged along and admit that I was impressed by both the presentation and discussion by a couple of dozen union safety specialists. Mary even scored a recorded interview with Barab for later use on a Safety First feature she does on the Heartland Labor Forum radio show on KKFI. Over the years Labor Notes has done a good job in tackling divisive issues in the workers movement–fighting for race and gender equality, defending immigrant workers, and collaborating with US Labor Against the War. They practice as well as preach internationalism—this year there were guests from Australia; Bermuda; Brazil; Canada; China; Colombia; Congo; Denmark; France; Germany; Ghana; Honduras; Hong Kong; Italy; Japan; Korea; Liberia; Mexico; Netherlands; Norway; Palestine; Poland; Sweden; United Kingdom. The biggest principled division within organized labor today is around climate change. The building trades, mine workers, and most rail unions support the denial of their employers and promote drilling, fracking, pipelines, and unit trains to extract and transport the fossil fuels that are the primary cause of global warming. The Labor Notes leadership are certainly not global warming deniers. But the issue is given scant attention at conferences–and some years none at all. I was on a 2008 climate workshop panel, along with Mark Dudzic and Les Leopold, that attracted about twenty and it was a proverbial preaching to the choir—nearly all were knowledgeable climate activists. This year’s workshop, about the same size, was just the reverse—the audience preached to the panel whose remarks mainly dealt with the modest environmental measures being taken by two local unions in the U.S. and the country-wide Canadian postal workers. Only in the discussion did some of us talk about the important work being done by the Labor Network for Sustainability in this country and Trade Unions for Energy Democracy globally. That’s not good enough. The climate change crisis—which is still getting worse—should be a centerpiece of every mass gathering of the working class. The crisis threatens the working class first and foremost—and only our class has the potential power to stop it. Labor Notes did not initiate any of the recent big class battles of teachers, nurses, transit workers, communication workers, grad students and others. But they helped organize effective solidarity with such actions. And they provide education to those new to union struggles through the magazine, many topical books and pamphlets, and local weekend “Troublemakers’ Schools.” While not “dual-unionists” they have become a unique institution within the broader labor movement. In comparing notes with a veteran socialist trade unionist well versed in labor history we agreed you would have to go back to the Trade Union Educational League of the 1920s to find any remotely similar precedent. The enhanced stature of the Labor Notes project signified by the 2800 in attendance is a tribute not only to the dedicated hard work of a small full-time staff and hundreds of followers; it is a new milestone in a recovering American working class prepared once more to do battle with the boss class in the workplace and beyond.